Google appears to be working on a new subscription service for Google Play. According to evidence gathered by the XDA Developers, the new service might launch under the name “Play Pass”. The potential new feature is expected to offer users a bundle of apps and games in exchange for a fee. This is quite similar to how streaming services like Netflix work. 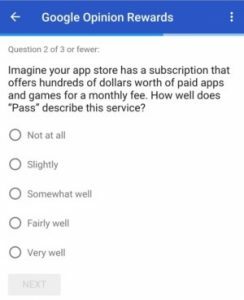 References to Play Pass were first spotted back in June, but an XDA affiliate recently received a Google Opinion Rewards survey which included some questions about Pass. Through them it was revealed, Google might be readying a service that could “offer hundreds of dollars worth of paid apps and games for a monthly fee“. Google has yet to officially reveal any details regarding the service, so at this point, we can’t be 100% sure Play Pass will actually see the light of day. Keep in mind that teardowns are speculative in nature, but the current evidence suggests that Google is at least considering implementing this sort of system. Implementing a subscription model of its own could be seen as Google’s latest attempt at generating more revenue via the Play Store. The Apple App Store is widely known for being quite prolific in this respect, and perhaps Google is hoping to close the gap by enticing users to pay a monthly fee to get access to top-rated apps and games. Information about Play Pass is quite scarce at the moment, so we don’t know how Google plans to go about it exactly. Which apps will make the cut? How will developers be compensated and so on? Google is obviously focusing on finding new ways to encouraged people to buy more content via the Play Store. In September, the search giant unveiled a new reward program called Play Points in Japan. The scheme allows users to earn points for purchases in the Play Store, and when they try new apps and games. These points can then be used for select in-app purchases or redeem them for Play Store credits. Given Google’s rising interest in boosting app and game purchases via its Store, an app subscription service might be the next logical addition to the company’s strategy.